Is Naheed Nenshi Destined For Bigger Things After Calgary Blowout? To no great surprise, Naheed Nenshi was re-elected as Calgary's mayor by a wide margin Monday. It is unlikely to be Nenshi's last electoral win. But does Nenshi have a future outside of Cowtown? Nenshi took 74 per cent of ballots cast for the mayoralty, beating his closest rival, Jon Lord, by 53 points. In 2010, Nenshi took 40 per cent in a close contest when he was elected to his first three-year term. The popular mayor appears to be in no hurry to cash-in on his political capital and make the jump to provincial or federal politics. But that has not stopped anyone from speculating about Nenshi's future — and with good reason. At just 41 years of age, as old as Justin Trudeau, he potentially has a long political career ahead of him. As a progressive politician, Nenshi is seen by many as a natural fit for the Liberals both provincially and federally. Alberta Liberal leader Raj Sherman recently told the editorial board of the Calgary Herald that he would "love to see Mayor Nenshi take the leadership of the Alberta Liberal Party once I get it to 30 per cent in the polls, once I fix up all the structure of the party." The Liberals have not governed the province since the First World War, and only elected five MLAs after taking just under 10 per cent of the vote in last year's election. But the party has rebounded a little, with the latest poll from Léger putting the Liberals at 18 per cent support, behind Wildrose at 33 per cent and the governing Tories at 31 per cent. It is not implausible that the party could continue to benefit from the sinking approval of the PCs. Ted Morton, a former cabinet minister and Tory stalwart in the province, has also highlighted the danger a Nenshi-led Liberal Party could pose to conservative forces in Alberta. With the right-wing vote divided between the Wildrose and PC parties, the Liberals could sweep the cities and win enough seats outside of Calgary and Edmonton to form a government and end the Tory dynasty that has ruled since 1971. It is likely a political fantasy, however. Nenshi has often reiterated his lack of interest in making a jump to provincial politics and the Alberta Liberals are not a particularly attractive option. A future in federal politics, however, might be more interesting. Trudeau praised Nenshi's leadership during the flooding the city suffered earlier this year and has made no secret of his admiration for the Calgary mayor. But with the next federal election just two years away, well before Nenshi's term comes to end, it is unthinkable that he would give up a job he seems to genuinely love so soon. And the Trudeau Liberals have often spoken about a two-election strategy. If they are indeed looking at a longer path to government, they would want to have their best team in place to present as a government-in-waiting at that point. 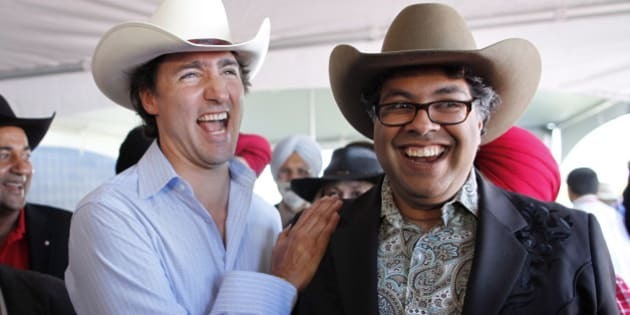 If Nenshi is re-elected in 2016 and decides not to finish out his third term, a popular, progressive, Western politician that can win seats in Calgary and Edmonton would be just the ticket for the Liberal Party. Perhaps Nenshi's next term in office will not go so well, or maybe he will decide he does not want to seek higher office until much later in life, if at all. We can be sure, though, that over the next few years some people in Ottawa will be watching Naheed Nenshi just as closely as Calgarians will. And if he is very ambitious... he does speak French.